Hanoi’s maritime capabilities get another boost. The Vietnamese Navy received two indigenously built, Russian-design missile ships on Tuesday to enhance its maritime defenses. The two Project 1241 Tarantul-class or Molniya corvettes, built in Vietnam at the Ba Son shipyard under the General Department of Military Industry following a Russian technology contract inked a few years ago, were officially handed over to the Vietnam People’s Navy (VPN) during a ceremony in Ho Chi Minh on Tuesday. The ships, coded HQ 379 and HQ 380, are among the six ordered by the navy, with the first two – HQ 377 and HQ 378 – delivered last year. The vessels are equipped with 16 Uran-E missiles of 130 km in range, two AK-630 ship-borne artillery systems, and an AK-176M automatic gun with. Their endurance is 10 days and they can travel at a maximum speed of almost 70 km/hour in standard conditions. The ships are designed to destroy groups of warships, amphibious ships, corvettes, and other kinds of enemy ships independently. In addition, they can also protect submarine and amphibious ships and perform reconnaissance missions. 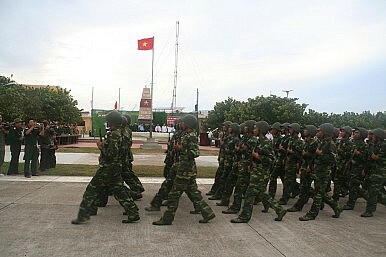 Deputy Defense Minister Truong Quang Khanh said the new boats would help boost Vietnam’s combat power and help protect its maritime sovereignty. He also added that they showed Hanoi could “fully master the technology and techniques of modern military shipbuilding.” Ba Son Shipyard is building a range of other military equipment for Vietnam. The two new vessels had successfully passed a test run conducted by the VPN and the Ministry of Defense in April. The remaining two ships are expected to be given to the VPN in the second quarter of 2016. Vietnam has been acquiring Russian hardware over the past few years to boost its naval capabilities to counter a range of threats, including China’s growing assertiveness in the South China Sea, which Hanoi calls the East Sea. Recent acquisitions include Kilo-class submarines, Gepard-class guided missile stealth frigates and Svetlyak-class fast patrol boats. Vietnam Commissions Two New Subs Capable of Attacking China Vietnam Gets Fourth Submarine from Russia amid South China Sea TensionsHow Will New Subs Affect Vietnam's South China Sea Strategy?Vietnam to Get Fifth Kilo Submarine from Russia in Early 2016Can Vietnam Get Its Military Out of Business?